The Jungle Boogie slot machine feels like a bit of a blast from the past when compared with some of the other slots out there. Playtech have stripped everything back here. There’s no bonus round, there’s no stacked wilds (in fact, there’s not even any wilds at all), and there’s only three reels and rows. One nice feature is the increased jackpot for those betting the maximum of three coins per line. More on that later, however. Incredibly basic machine. Nothing to understand, and no frills. If you’re a slot purist, you’ll probably enjoy Jungle Boogie. Nice large jackpot with an increased bonus jackpot for the luckiest players. The simplicity of the layout and gameplay might be too much for some. Slots have come on a long way since the three reel, three row machines of old. The lack of features here will certainly put many players off. Art style is also very basic. There’s not a great deal to get very excited about here. Unless you’re of a minimalist persuasion. The top jackpots for the game are all awarded for betting the maximum of three coins per spin. This doesn’t mean you must bet huge to be eligible, you can set the coin value to the minimum, and bet the maximum. The highest prizes are awarded for three-of-a-kind of the top value symbols. These are the tiger, the baboon, and the parrot. Tiger = 1,000x the coin value. Baboon = 500x the coin value. Parrot = 200x the coin value. Tiger = 2,000x the coin value. Baboon = 1,000x the coin value. Parrot = 400x the coin value. Tiger = 4,000x the coin value. Baboon = 1,500x the coin value. Parrot = 600x the coin value. Note: The top jackpot for three tigers is 4,000 coins as opposed to 3,000. The pattern of multiplying the prizes by the number of coins bet is not consistent here. This is additional value from the machine, and should always be taken to maximise the player’s RTP. The only real feature of Jungle Boogie is its absolute lack of features. There are no bonus rounds, no wild symbols, and no scatter symbols. This makes the slot ideal for some, and tedious for others. It’s all personal preference on this one. In addition to the higher value symbols mentioned, there are also some which will earn lesser prizes. We’ve outlined the pay outs for the maximum bet of three coins only below. 3x Fish = 450x the coin value. 3x Monkey = 300x the coin value. 3x Leopard = 150x the coin value. 2x Fish = 15x the coin value. 1x Fish = 6x the coin value. 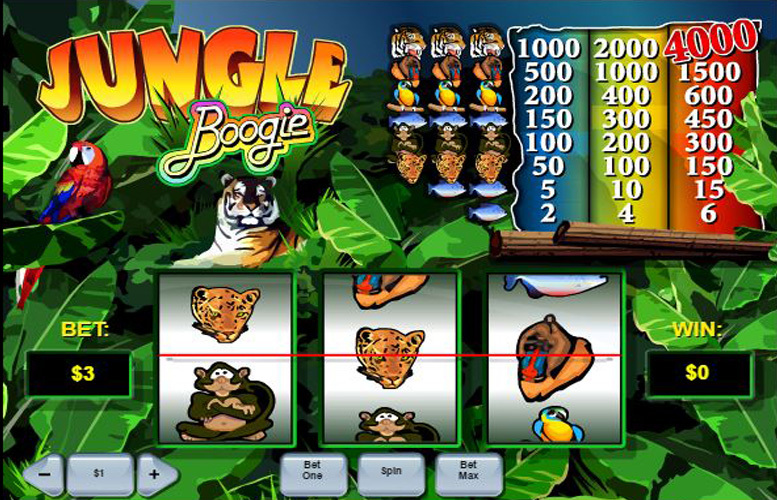 Despite the lack of features, and the minimalist facia of the machine, the Jungle Boogie slot does offer players quite a large scope to vary their bets up. As mentioned, players can opt between betting one coin per spin, and three. In addition, they can amend their coin value between a miniscule 1p, and a massive £5. This makes the minimum possible bet 1p, and the largest £15. This slot is a bit of an odd one to review. It really comes down to a player’s own personal preference. If stripped back games with no frills are your thing, you’ll love Jungle Boogie. However, if you’re a fan of the varied, and innovative bonuses of some of Playtech’s other offerings, it might be best to give this one a miss. If you can look past the basicness of the gameplay, the slot does offer an incredibly juicy return-to-player rate. This game has a rating of 3 / 5 with 411 total reviews by the users.